It is common among Christians that tend to think and believe that the Trinity is all over in the Bible. They insist in the belief of the Trinity of three co-equal, co-eternal Persons in the One God is the true faith. Many very well-known Bible Scholars do not think Jesus is God in a Trinitarian sense, in the New Testament. Many distinguished scholars maintain that the doctrine of Trinity is not taught nowhere in the Bible. Let’s now focus and respond to the verses Christians use in defence of the Trinitarian belief. We will respond to two verses, which is Matthew 28:19 and 1 John 5:7. Before proceeding any further, let’s first define what the Christian Trinity is. The Father is not the Son, nor is the Son the Father, and the Spirit is not the Son, nor is the Spirit the Father. They are all distinct from each other. Yet there are not three Gods, but One God (this is according to Christians). Any human with a sound/sane mind, who is looking for the truth, will see that the Christian doctrine of the Trinity is a contradiction to what God Almighty stated in the Old Testament. Furthermore, this kind of doctrine is never taught by Jesus or his disciples and thus contradicts everything what Jesus taught. If Jesus (p) really taught the doctrine of the Trinity, how come there is not one verse where he states:- “God is One but in three persons” i.e., something along the lines of, “Father is God Son is God and the Holy Spirit is also God?” Anyone reading throughout the New Testament will see Jesus saying: “Hear, O Israel: The Lord our God, the Lord is one.” Jesus taught Monotheism not Polytheism. King James 2000 Bible (©2003) Matthew 28:19 Go you therefore, and teach all nations, baptizing them in the name of the Father, and of the Son, and of the Holy Spirit. Acts 2:38 – Then Peter said to them, “Repent, and let every one of you be baptized in the name of Jesus Christ for the remission of sins; and you shall receive the gift of the Holy Spirit. Acts 8:16 – For as yet He had fallen upon none of them. They had only been baptized in the name of the Lord Jesus. Acts 10:48 – So Peter ordered them to be baptized in the name of Jesus the Messiah. Then they asked him to stay there for several days. If Matthew 28:19 is true, genuine and Jesus did command his disciples to baptize ”in the name of the Father, and of the Son, and of the Holy Spirit.” Why would Peter go against Jesus command and Baptize only in His name? Well the answer lies in the Text. The formula of the “Father Son and Holy Spirit” is not part of the original text of Matthew. How do we know it is not part of Text? Well let us turn to the respected Scholars. Eusebius (260 – 339 CE) was a Roman Christian historian and is regarded as a well learned Christian scholar. He became the Bishop of Caesarea in 314 CE. He quotes many verses in his works, and Matthew 28:19 is one of them. 17 times in his works prior to Nicaea, Eusebius quotes Matthew 28:19 as “Go and make disciples of all nations in my name” without mentioning the Trinity baptism formula. We have referenced five quotes and all of them agree that Matthew 28:19 formula of the “Father, Son and Holy Spirit” is not original. The book of Acts is enough to throw away the Trinitarian false Doctrine once and for all. We also gave Eusebius who read the verse as “Go and make disciples of all nations in my name”. King James 2000 Bible 1 John 5:7 For there are three that bear witness in heaven, the Father, the Word, and the Holy Spirit: and these three are one. Let’s now bring forth evidence from the experts. Let’s see what their views are on 1 John 5:7 i.e. is it a genuine verse or is it a forgery? …..I will here simply remind the reader that Erasmus introduced the passage into his third edition of the Greek Testament in 1522 abd Luther died in 1546…. Luther after quoting the passage of three heavenly witnesses, remarks:- ‘These words are not found in the Greek Bibles; but it seems as if this verse had been inserted by the Orthodox against the Arians….. We may observe finally that the other early reformers and friends of Luther generally rejected the passage; so Zwingli, Bullinger, Ecolampadius, Bugenhagen (Rickli, ubi supra, pp. 35, 36). So, also, according to Kettner (Histpria dicti Johannei… 1 John v. 7 etc., 1713, cap. 13), Melanchthon, Crucigner), Justus Jonas, Forester, Aurogallus. (see Semler, Hist. U krit. Sammulugun uber 1 John v. 7, 1. 248.) Bugenhagen, as we have seen, was especially strenuous against it; see his Exposito Jona, 1550, cited by Rickli, p. 39. It was also omitted in the Celebrated Lati version of the Bible by Leo Judae, Pellicanus, Peter Cholin, Rudolph Gualther, and others printed at Zürich in 1543. Fol., and commonly called the Zurich Bible or version Tigurina. A Marginal note explains the reason for its rejection…. To trace the history of this gross corruption of the Text in modern Translations, Catechisms and confessions of Faith, especially in the Greek church since the sixteenth century, and in modern editions of some ancient versions, as Peshito Syriac, Armenian and Slavonic, might be interesting and instructive, psychologically as well as critically; but there is no room for it here. (1) In any independent Greek MS (more than 180 MSS and 50 Lectionaries are quoted). Both the late MS which contain it have unquestionably been modified by the Latin Vulgate. (2) In any independent Greek writer. The very few Greek writers who make use of the words derived their knowledge of them from the Latin (not in Ir Cl.Al Orig Did Athan Bas Greg. Naz Cyr.Al). It is quite clear from all the above scholarly quotes that 1 John 5:7 is a forgery, and it originally was not part of Bible but was added. Let us now quote references and see where did the Trinity come from? Is the Trinity in the Bible? Did the Triune – God formula come from Jesus teachings or someone else i.e. the Church Fathers? Conclusion: A) None of the disciples baptized: “in the name of the Father, and of the Son, and of the Holy Spirit.” B) The formula that is quoted i.e. “Father, and of the Son, and of the Holy Spirit” is never once referenced, not in any of the Gospels nor of Paul’s letters. C) Eusebius (260 – 339 CE) never once mentioned the formula, “Father, and of the Son, and of the Holy Spirit” instead he only mentioned the name of “Jesus.” D) The Scholars quoted all agree that it was not part of the original text but an interpolation. All the evidence quoted by the experts proved that 1 John 5:7 is a fraud, it was added in 1500th century by Erasmus. The words that are quoted by the KJV for 1 John 5:7 is not found in any Greek MSS. All in all the evidence we provided is in our favour that Matthew 28:19 and 1st John 5:7 are not genuine verses. Christians need to let go off the Trinity – Triune God, for Jesus never taught such doctrine. God never said he was a Trinity. The Bible never mentions anything about God being “three.” The Bible never mentions nothing about God referenced as a “Person.” Lastly the Bible never mentions anything about the “Holy Spirit” being God. I will finish off with these verses from Jesus mouth and what God says of himself in the Old Testament. ISAIAH 40:25 – To whom will you compare me? Or who is my equal? says the Holy One. DEUTERONOMY 4:35,39 — Unto thee it was shewed, that thou mightest know that the LORD he is God; there is none else beside him. (39) Know therefore this day, and consider it in thine heart, that the LORD he is God in heaven above, and upon the earth beneath: there is none else. ISAIAH 43:10-11 – Ye are my witnesses, saith the LORD, and my servant whom I have chosen: that ye may know and believe me, and understand that I am he: before me there was no God formed, neither shall there be after me. I, even I, am the LORD; and beside me there is no saviour. ISAIAH 44:8 – Fear ye not, neither be afraid: have not I told thee from that time, and have declared it? ye are even my witnesses. Is there a God beside me? yea, there is no God; I know not any. ISAIAH 46:9 – Remember the former things of old: for I am God, and there is none else; I am God, and there is none like me. HOSEA 13:4 -Yet I am the LORD thy God from the land of Egypt, and thou shalt know no god but me: for there is no saviour beside me. MARK 12:29-34 — And Jesus answered him, The first of all the commandments is, Hear, O Israel; The Lord our God is one Lord: And thou shalt love the Lord thy God with all thy heart, and with all thy soul, and with all thy mind, and with all thy strength: this is the first commandment. And the second is like, namely this, Thou shalt love thy neighbour as thyself. There is none other commandment greater than these. And the scribe said unto him, Well, Master, thou hast said the truth:for there is one God; and there is none other but he: And to love him with all the heart, and with all the understanding, and with all the soul, and with all the strength, and to love his neighbour as himself, is more than all whole burnt offerings and sacrifices. And when Jesus saw that he answered discreetly, he said unto him, Thou art not far from the kingdom of God. And no man after that durst ask him any question. Mark 12: 29 Jesus replied, “The most important commandment is this: ‘Listen, O Israel! The LORD our God is the one and only LORD. « Was Jesus Hanged or Crucified? Several important points are raised in today’s article. And yet, Christ claimed the Father as His Caliph—“‘the Father is greater than I’” (John 14:28). However, the author’s textual criticism of 1 John 5:7 (KJV) is excellent and highly a propos. 30 translations I consulted now -the ASV, BBE, CEB, CEV, CJB, CSB, DBY, EMTV, ERV, ESV, EXP, GNT, GWT, HCSB, HNV, INR, ISV, LEB, MSG, NAB, NASB, NCV, NIV, NIRV, NRSV, RSV, TNIV, VOX, WEB, WNT – provide the corrected text. Thanks for the article. I will write something on that verse as well soon In Shaa Allah once I am done with finishing the other articles. Think about this. The greatest abuse and unforgiving act would be to stab someone while that someones body was hanging off a cross. It is strange that matthew and luke repeat many details from marks account and within their own accounts they have an angel say that jesus is on his way to galilee and then they have jesus repeat exactly what the angel said.the stabbing of jesus, while he was alledgly dead , would be standing out more than fhe crucifixion. It wiuld be glowing like an indigo highlighter. We would expect mark to say ,”when pilate was suprised to hear that jesus died so quickly, one of the guards grabbed a sword and pierced jesus side for fun” like I said in my previous reply, in all synoptics the hole in jesus side does not exist. AND LOOK @ THIS , “the gospels are fundamentally irrational. If the father god had really put out the sun, caused the saints to rise from the dead, and caused an earthquake that had torn the temple veil, pilate would not have to station guards at his tomb in the event that an empty tomb would cause people to think a miracle had happened. Everyone would already know that multiple miracles had just taken place! The story is not even internally logical, which is a sign of it being mythological in genre.” christians have people witnesses miracles and then SOMEONE decides to STAB jesus’ side ? if these story tellers from the false gospels were good at inserting LIES into thier holy texts, we must figure OUT what POLICING and what controls they had in thier oral traditions. Several important points are raised in the article. Thank you for commenting. I see you are not satisfied with the information I have provided for Matthew 28:19. Soon I should be publishing another new article on Matthew 28:19 with a lot more information. Hope from that evidence I will present it will make you change your mind and agree with me that the passage is not genuine. Is the phrase “in the name of the Father, and of the Son, and of the Holy Spirit” used elsewhere aside from Matt 28:19 in scripture? Not once. Are there older Matthew 28:19 manuscripts in the 2nd or 3rd century to solidify trinity? No older manuscript exist. Did Jesus use the phrase “in my name” on other occasions? Yes, 17 times. Facebook, or Fa(r)cebook™, is partially censoring me from sharing your link. I don’t know if this is happening to others. It seems the nature of the censorship varies depending upon whether it is on my wall or whether posted in a Group/Page/Community. Perhaps others here may want to test this webpage link on their own Wall/Timeline and on your Facebook Pages/Groups/Community-ies to see if they are experiencing censorship too. This is my comment from elsewhere regarding this. “__Appears the censorship is the same as before. It will allow me to post the link in a group that I am moderator of, and do so automatically without requiring a passcode and falsely suggesting the link “MIGHT BE UNSAFE”, but it will AUTOMATICALLY CENSOR THE PREVIEW meaning the link will not likely get noticed. While on my own wall when I try to post it will automatically prevent me from posting without putting up a window falsely claiming the link “MIGHT BE UNSAVE” and requiring a passcode in order to post. But once the passcode is entered then the post gets posted automatically with the preview. These conditions can slow down the spread of information Fa(r)cebook and its State and Coporate sponsors don’t like many many times, because each person has to go through some trouble to post it, and the fact that it is falsely suggested to be maybe unsafe will be a barrier to many to post! Sorry to hear that Facebook is censoring some articles on the Trinity. I will try and see if I can speak to someone to fix it. The one who benefits me most, is the one from whom I learnt and increase in knowledge of God and what to do to please HIM. You are so far from understanding the truth about the Trinity. This doctrine is solid and there are so many things that Jesus said about himself in relation to the Father that proves that there is a combined union of persons in the God head. One God (Trinidadians don’t believe in three Gods, we believe in one God in three persons) over all creation. The union of the trinity is not like mans union, or mans cooperation where everybody has his or her own mind, personality, short comings, insecurities, reservation, etc. Rather it is one mind, one will, one plan, one heart, one love, without any of the humans fallen tendencies, short comings, insecurities, etc. Sigh…..oh my God…i didn’t know that Trinitarians still use John 8:58 to support their doctrine…. Thamk you so much for clarifying article. I am just stunned that despite the fact that Theological schools with proper credentials highlights this during their courses on Bible history none of this is ever mentioned from the pulpits. It should be a matter of grave concern that it appears that there is some kind of conspiracy to keep this from ordinary members of Christian congregations. This puts a grave question mark behind the veracity and sincerity of the churches of all denominations. @Clifton… I agree! I don’t believe attending church as we know it today is what worship is. My study on tithe and what the church tells us tithe is about ….. Can’t stop shaking my head! Wolves are in every church. True worship is to me a personal one on one of perhaps even in small group gatherings. We have been deceived on everything we thought truth. One must study both old and New Testament to weed out any errors. The bible is amazing once you start to understand its message. Whose blood? The blood of the covenant, the blood of the lamb. I find this facinating. With all the evidence provided the trinitarians will still not listen. The scriptures clearly state that the father is the only saviour, and there is no other God, even in heaven!! But When The Comforter Is Come, Whom I Will Send You From The Father, Even The Spirit Of Truth, Which Proceedeth From The Father, He Shall Testify Of Me. “3 personages” so what? How exactly does that support the assertion of a Triune godhead? 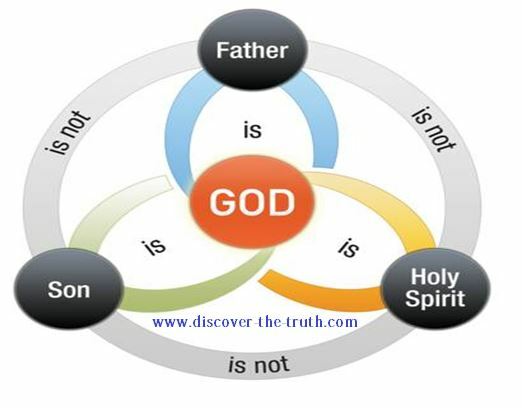 In THE NAME, not in the names, so that proves that the father, the son and the Holy Spirit are one god. Besides that, the same concept can be found in the first century Didache and even the early church fathers have said it as well. This is an argument that will not be proven one way or another to everyone’s satisfaction but what is sure is the division that lies in the concept of GOD. Christians & Muslims believe in one GOD but Christians believe JESUS was the Son where Muslims believe he was a prophet yet JESUS said he was the Son so how can he be a prophet? There are many sects, churches, & organizations within both Christian and Muslim “groups” – I find it troublesome that some within both groups are willing to kill the other over the understanding of their own scriptures. Highly educated men and women can read the same passage, be it from the Bible or the Qu’ran, and have a different interpretation. From that difference, the arguments start that develop into hatred and death. Being a Christian, I believe GOD’s nature cannot be fully understood but we have been a given a glimpse into it. We should read & study & debate for it is OK to stand strong in our faith but I think both Christians & Muslims should do as Paul said in Matthew 10:14 and make every effort to do as JESUS said in Matthew 5:44 (Muslims go to Qu’ran 41:33-34) then we can let GOD reign in all our lives. The need for humans to be right, to be in control, to have power is the basis of pride & pride is Satan’s favorite tool. I am not a Biblical scholar but I am sure GOD understands that I love him & if I don’t understand the true nature of his being, he’ll forgive me for that 🙂 On the flip side, I think he will punish us for hating and killing each other over our differences!